The end of the Fourth Republic had brought with it an anti-parliamentary spirit to France. However, some were doubtful that the new government could survive, especially considering that France still faced many problems. De Gaulle had taken the office of President, but he had not been elected directly. Instead, he was voted in by an Electoral College, an assembly of 80,000 Members of the French Parliament and local elected officials. This college had given him 79% of the vote to 13% for the Communist candidate and 8% for the candidate of the leftist Democratic Forces. However, De Gaulle felt that him being responsible to an Electoral College would not provide the Presidency with the legitimacy that it would need in order to control the Government. He decided that direct elections to the Presidency would be the only means by which he could get this legitimacy. Direct presidential elections had not been done in France for 110 years at that time. The electoral system for the Presidency would be broadly similar to that used for the National Assembly. In order to become a candidate, a person needed to have 500 signatures from local politicians. In the first round, voters would vote for one candidate. If one candidate won a majority of the votes in this round, they would be elected. If no candidate won a majority, a second election would be held 14 days later. Unlike the electoral system for the National Assembly, only the top two candidates would be permitted to contest the second round. This appears to stem from a desire to ensure that the President received majority support from the public. The President would serve a term of seven years, and could only serve two terms in a row. A seven-year term is fairly long by international standards, but clearly De Gaulle wanted the President to be in office for a long term; perhaps he viewed this as important for long-term planning. The above proposal was endorsed in October 1962 in a referendum. This referendum was controversial, as the National Assembly had not endorsed it. However, despite this, 62.2% voted Yes, thus meaning that De Gaulle had a strong mandate for the changes. Following this, a legislative election took place in November. The National Centre of Independents and Peasants, a centre-right party, had split, with a group leaving to join Charles de Gaulle's Union of the New Republic to provide De Gaulle with a presidential majority. The result was a convincing win for the Gaullists, who came very close indeed to a majority. In their agreement with the Independent Republicans, they controlled about 54% of the seats. Another impact of the electoral system was that the Communists were still under-represented, as they struggled to form alliances in the second round. De Gaulle could not count on support from the other centre-right parties, due to their opposition to presidential government. Three years later, De Gaulle went to his first presidential election. He was still fairly popular, and it was generally expected that he would comfortably win re-election. He was still a polarising figure, however, and the two-round system would be expected to work against him if he faced a moderate opposition candidate. Francois Mitterand was chosen as the candidate of the united left, excluding the Communists, who nonetheless endorsed him. He put up a fairly strong performance, and deprived De Gaulle of a victory in the first round. This result was confirmation of the idea that presidential elections encouraged alliance-building. The left, fearing the possibility of not making the second round, ran a united candidate, which reduced fragmentation. Another legislative election took place two years later, in 1967. Mitterand had installed himself as Socialist leader, and the Independent Republican party had merged into the Gaullist party, while the two centre-right to centre parties merged into the Democratic Centre. The Gaullists came very close to a majority, although presumably the centrists were willing to offer support to the government, or at least abstain to prevent the left-wing from controlling the Assembly. The next year in France saw significant social conflict. The left had made small gains at this election, especially the Communists. This result meant that the Socialists felt the need to form an alliance with the Communists, thus creating a left-wing alternative to the De Gaulle government. In May, small student protests began against De Gaulle's government. These ballooned into a strike (not unusual in France), which was unusually large and independent of the traditional trade unions. Despite a fairly generous wage deal, the protests continued, and became so large and so destructive to the French economy that the nation began to collapse. Late in May, De Gaulle was so concerned about the progress of the protests that he decided to leave for Germany. Once there, he gave a speech calling an election, and for workers to return to work. Hopeful of a victory, the Communists agreed to an election. The movement subsided over the next few months, and by June, France's economy had returned to normal. The legislative election was marred by the left-wing parties (the Socialists and Communists) agreeing to an effective coalition deal, which was not especially popular with a public concerned about a Communist-dominated government. The result was a landslide win for the Gaullists, mostly at the expense of the left. The Communists lost more than half their seats, while the Socialists won their lowest share of the seats since 1958. The centre also lost a significant number of seats. But, more importantly, this election showed that the two-round system can be very, very disproportional. The Communists and Socialists only lost 2% of their vote from 1967, but the disproportional nature of the system meant that both parties were massively unrepresented. By this point, however, De Gaulle was aging, and pressure was mounting on him to step aside for a younger candidate. However, in 1969, he pressed ahead with a proposal for reforming local government and the Senate. The proposed reforms had dramatic consequences for the Senate. Half of its members would be elected by local government, and half would be appointed by representative bodies for social groups, in a similar manner to the Irish Seanad. This new body, however, would have a purely consultative function. Passage of these reforms would turn France into a nation that was bicameral, but in name only. This was perceived by local authorities as a power grab, and was fiercely opposed by them. The centrists, who had their power base in the local authorities, declared their opposition too. The left-wing opposition parties, too, had their concerns; they felt that a Gaullist-dominated lower house could ram through legislation that they opposed, and seeing as government was so far away from them, they did not feel that this disadvantage would be outweighed by the advantage of complete power if they won. Combined with this was a proposal for decentralisation. It would create regional government, which would have control over housing, as well as all the other issues that French local government controlled. These would be governed by regional councils, which would be indirectly elected. De Gaulle had staked his reputation on the referendum, and had threatened to resign if it did not pass. This was a dangerous gamble, although as De Gaulle was elderly at the time, it was not especially unlikely (in fact, De Gaulle would not live out his presidential term). When the votes were counted, 52.4% of the electorate had voted No. This was a fairly narrow defeat, but De Gaulle kept his promise, and resigned on 28 April 1969. In an interim capacity, he was replaced by Senate President Alan Pohler. But, unlike the United States, Pohler would not replace him for the entire term; he would only serve until new presidential elections could be held. Pohler ran for President as a centrist candidate. He was opposed by former Prime Minister Georges Pompidou as the candidate of the Gaullist Union for the New Republic. The Communists ran Jacques Duclos, and Gaston Defferre ran as the Socialist candidate. The first round result was a comfortable lead for Pompidou, while Pohler managed a narrow second. The second round was a more comfortable win for Pompidou, but it demonstrated a problem with the system. Left-wing voters, who comprised the largest opposition to Pompidou, were not given much of a choice. Some of the more moderate leftist voters preferred Pohler, as the 'lesser of two evils'. Others just didn't turn out, or cast informal votes; turnout in the second round went from 77% to 68%, and the informal vote went up from 1% to 6%. This feature of the two-round system in presidential elections was to have serious ramifications later. Legislative elections took place in 1973. In the period leading up to it, the Socialist Party, once again led by Mitterand, signed an agreement with the Communists outlining what a Communist-Socialist government would do. It called for mass nationalisations, the introduction of proportional representation, the dissolution of NATO and the Warsaw Pact, and unilateral nuclear disarmament. This was a double-edged sword; on one hand, the Gaullists could raise fears about the Communists now that it was official that any left-wing government would include them, but the agreement could potentially lay out exactly what the left proposed, thus showing some transparency. The advantage for Mitterand was that he would be able to moderate and tame the Communists, and hopefully reduce their relevance and cement the Socialists as the major leftist force. The agreement split the left, however. Certain members of the Radicals opposed it, and formed an alliance with the centrists, while the left of the radicals stayed with the left, becoming the Union of the Radical Left and signing the Common Programme. This division persists to this day. The centre-right won a fairly comfortable victory, although it was a loss from the heights of 1969. The left made fairly substantial gains, and both parties benefited from the alliance. The centrists had minor losses. The election showed the weak relationship between votes and seats in the two-round system. The Gaullists only lost 1% of the second round vote from 1969, but thanks presumably to greater coordination between the Socialist and Communist parties, lost about 17% of their seats. Of course, their vote share was still lower than their seats share, thus making them beneficiaries of the system, but it was a weaker benefit. At this point, President Georges Pompidou had fallen ill. He had been suffering from cancer, and on the second of April, 1974, he died. He was replaced, once again, by Senate President Alan Pohler, for the interim period up until the election. The next presidential election saw the widest field of candidates yet. The Independent Republicans, a centre-right pro-Gaullist party, ran Valery Giscard d'Estaing, while another Gaullist, Jacques Chaban-Delmas, ran as the Union of Democrats for the Republic. Giscard was more moderate than Chaban-Delmas. The UDR was much larger than the Independent Republicans, but, as you will see, this did not necessarily guarantee their candidate a lead within the centre-right. The 1974 presidential election was the first one for the left running under the Common Programme, and this presented a dilemma. The Communist Party were (narrowly) the largest party on the left, but they were ideologically extremist, and a Communist candidate for the presidency would give the centre-right a useful angle of attack on the left. In the end, it was decided to nominate the more moderate Francois Mitterand, who you may remember as the candidate of the Socialists who had pushed De Gaulle into a second round in 1969. This was evidence that the two-round presidential system was removing extremism and encouraging moderates. Other than these three, the rest of the presidential field was fairly minor. 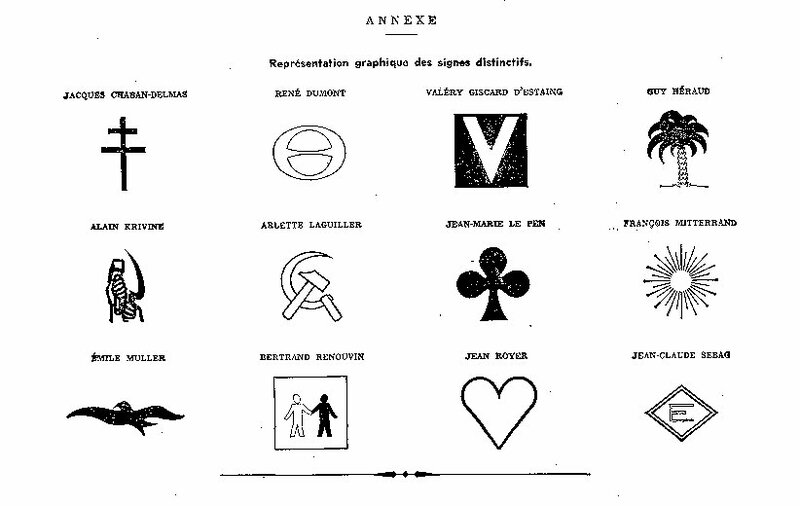 Jean Royer, a Minister and Mayor, ran as an independent for social conservatism (with a minimalist campaign), while Arlette Laguiller ran as the Trotskyist candidate (she was the first woman ever to run for a presidential election in France). Rene Dumont ran as an environmentalist candidate, and Jean Marine Le Pen (whose name you will hear again) ran as the far-right candidate. In the early days of the first round campaign, Mitterand was winning 35-40% of the vote, while Giscard and Chaban-Delmas were on about 25% each. However, as the campaign wore on, Giscard began to pull out a lead, while Chaban-Delmas fell back in to the high teens. In the end, it was not even close. Giscard won an easy lead over Chaban-Delmas. This showed that presidential elections were becoming more personalised; while Chaban-Delmas's party was much larger than Giscard's, this did not help him. The second round campaign was very, very tight. Polls generally gave Giscard a very narrow lead, or showed him tied with Mitterand, but the leads were narrow. The result was a very narrow win for Giscard, based off strong flows from Chaban-Delmas. This showed a clear advantage of the two-round system; the candidate with the broadest support could win, rather than just the largest minority. Giscard's government style was fairly liberal and centrist. This provoked controversy amongst certain sectors of the UDR, which the Socialist-Communist alliance exploited. In 1977, a local election resulted in a significant number of left-wing gains, a fair few of which were made at the expense of UDR-centrist splits. At this point, the centrist movement had renamed themselves the Union for French Democracy (UDF), and Giscard had joined the party. The Gaullist right reacted by reforming themselves into a new party, called the Rally for the Republic. Legislative elections were scheduled for 1978, and it was felt that the Socialist-Communist alliance would win, based off their success in the local elections. However, the Common Programme was not renewed in the lead up to the election, thus meaning that the cooperation that had given the group such a strong result in 1973 would not be quite as evident. The reason that the agreement was not renewed was that the Communists were concerned that the Common Programme was sapping their electoral support; not an unreasonable concern. The result was the first since the end of the Third Republic where the Socialists were larger than the Communists, thus showing that the Socialist strategy was working. The RPR won the most seats and votes on the right, thus exacerbating the conflict between RPR leader Jacques Chirac and Giscard. Giscard was the first president to serve out his entire term and run for re-election in 1981. He was opposed by Francois Mitterand, who ran as the Socialist candidate, Jacques Chirac, who ran as the RPR candidate, and Georges Marchais, who ran as the Communist candidate. Giscard won a narrow first, but came comfortably ahead of Chirac. The same went for Mitterand, who finished comfortably ahead of his leftist rival. Relations between the candidates in the runoff and the candidates who had dropped out would be vitally important to determining the winner. Marchais, Crepau and Laguiller all wholeheartedly endorsed Mitterand, but Chirac, whose relationship with Giscard was rocky at best, only offered his personal support, and did not endorse Giscard. There were even allegations from certain political figures that Chirac had made a pact with Mitterand. Whatever happened between the parties, Mitterand won narrowly. He became the first Socialist president since 1954, and the first one to be directly elected. His presidency, however, did not start auspiciously. The next year, local elections took place, which resulted in a loss of 35 seats in the cantons for the Socialists, and 47 seats for the Communists. More local elections in the next year, in which the right won 61% of councillors. In the 1984 European Parliament elections. The joint RPR-UDF list won 43% of the vote, while the Socialists only managed 20%, and the Communists crashed to 11.2%. This election was also notable for the strong performance of the National Front, who won 10.9% and the same number of seats as the Communists. Seeing that he would likely lose the next legislative elections, scheduled for 1986, Mitterand decided to introduce proportional representation, a belated manifesto promise. While he ostensibly did it in order to make French elections fairer, the timing made many political figures suspicious that he was doing it in order to avoid a landslide loss in the legislative elections. The proposed proportional representation system was not especially proportional. It was party-list proportional representation. It used 2-24 member districts, with an average magnitude of 5.5 seats. Voters voted for parties only; lists were closed. Seats were distributed by the D'Hondt method, with a 5% threshold in districts to win seats, which would not be relevant in most districts. This was a fairly disproportional system that would not quite be fair to the smaller parties, but this would not matter too much to Mitterand; his interest was only in ensuring that his Socialists would be under-represented. The electoral system was criticised by the right, who not only viewed it as a cynical attempt to reduce potential losses in the upcoming election, but as an attempt to split the right by allowing the National Front to win seats. The result was a narrow win for the centre-right, who won 51.2% of the seats. While this was far from a comfortable majority, the presence of the National Front meant that the left were also far from a majority. This meant that, in order to avoid political gridlock, Mitterand would have to deal with the right, an effective coalition deal known as cohabitation. This was the first time under the Fifth Republic that the legislature and presidency were controlled by different parties. The election also saw the further decline of the Communist Party, who won their lowest vote share since 1932. The National Front won a very strong result, and to this day the result is the best. However, the district-based PR system meant that they were under-represented, as were the Communists and other small parties. President Mitterand appointed RPR leader Jacques Chirac as Prime Minister. The deal was tense, and Chirac was forced to use the National Assembly's power to pass laws without presidential approval a number of times. However, importantly, the proportional representation system was repealed, and was replaced by the two-round system, virtually unchanged from the pre-PR system. The only change was that the threshold for entry into the second round was raised to 12.5%. Mitterand was not happy with this arrangement, however, and the 1988 presidential election resulted in the unhappy scenario of the two heads of government facing each other as the major candidates. 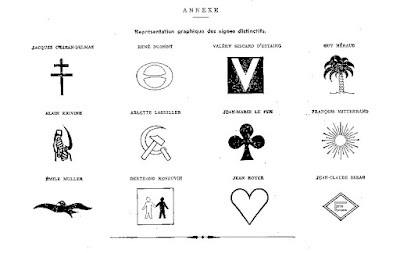 Other candidates included Union for French Democracy candidate Raymond Barre (nominally independent, but strongly supported by the UDF), National Front candidate Jean-Marie Le Pen, and Communist candidate Andre Lajoinie. Polls showed Mitterand in a comfortable first in the first round, followed by Chirac and Barre in the high teens. The result was a comfortable lead for Mitterand, followed by a somewhat less comfortable second place for Chirac ahead of Barre. The big surprise was the strong result for Le Pen, who won the strongest ever result for the National Front; it was felt that part of this was due to the increased status that the large National Front caucus in the National Assembly had given the party. The Communist Party managed a disastrous 6.76%; Mitterand's mission to make the Socialists the largest party on the left had overwhelmingly succeeded. Mitterand had won a second term, and the fairly comfortable win emboldened him to call a new legislative election. This election saw a strong President, as leader of the largest party on his political faction, facing a right-wing divided between the National Front, the RPR and the UDF. The abolition of proportional representation meant the government had the upper hand, as they could exploit this division. The result was a narrow win for the parties of the left. Leftist candidates won 52.71% of the seats, while the right won the remaining seats. While it was a narrow result, it did give the Socialists the option of a deal with the UDF if the Communists opposed their legislation. The disproportionality of the system was even clearer with the rise of the National Front, who won 9.66% of the first round results, almost the same as in 1986. However, they only won a single seat (which is not visible on the graph, it's so small) instead of the 35 they managed under proportional representation. This was because of their status as a 'pariah party', whose ideology was so repugnant to the other parties that they could not form the alliances needed to win seats under the two-round system. The result was a narrow win for the Rally for the Republic-Union for French Democracy list, but it was a very weak win. Both major parties were weakened by the presence of two new parties; the Greens on the left and the Centre of Social Democrats (a centrist group that was originally part of the Union for French Democracy). The strong Green result meant that the Socialists, who had initially ignored the Greens as a fringe party, were pressured to do a deal with the Greens. The disastrous result for the Communists made it clear that the party was dead as a major political force. In 1991, Rocard left office and was replaced by Edith Cresson. She turned out to be massively unpopular. The Socialist Party won control of only one regional government in the 1992 elections, compared to one for the Greens and 22 for right-wing candidates. Cresson was replaced by Pierre Begovoy, who failed to improve the waning support for the left. In 1993, a legislative election took place that resulted in a hammering for the Socialists and a landslide win for the right. The result was a disaster for the Socialists, and by extension President Mitterand, who was once again forced into cohabitation with the right. Once again, the National Front managed a strong result in the first round, and a fairly decent result in the second, but once again only one seat. The ecologists won less than half a percent in the second round, and no seats. As the Communists lost support, they also shed their pariah status. Mitterand appointed Edouard Balladur, a RPR politician, as Prime Minister. Presidential elections took place in 1995. Mitterand, who had spent two tiring years in cohabitation and had contracted cancer, was in no position to run for another term. The Socialist Party nominated Lionel Jospin, a former minister who lost his seat in 1993, in a primary election where he won 65% of the vote. Chirac ran again, but he was opposed on the right by Balladur, who ran as a RPR candidate with support from the UDF. Early polls showed Balladur leading Chirac, but as the campaign wore on, Chirac entered into the lead. The result was a fairly comfortable win for Chirac. Nonetheless, Jospin polled fairly well considering the poor economic situation. Le Pen won the strongest result ever for the National Front. In an attempt to cut the deficit, Chirac introduced a number of controversial changes to the pension system. These included an increase in the period public sector workers were required to contribute to pension funds by 2.5 years, increases in health insurance contributions for the elderly and unemployed, and increases in the retirement age for public sector workers. This led to a strike of public sector workers; a strike on the railways lasted three weeks. Despite these, the government did pass some of the changes, and Chirac, who was hoping to catch the left off guard, called a legislative election in 1997. While the RPR-UDF did have a lead in the early days of the campaign, this was worn away through the campaign. The result was a win for the left-wing parties, who won 55% of the seats. The result saw the Greens, who had been accepted into the leftist camp, enter the National Assembly for the first time. The result showed the importance of entering an alliance with major parties; had the Greens stayed outside the left, as they had done up to now, they would have had no seats. This represents an interesting dilemma for small parties in France; do they stay ideologically pure and have few seats in the National Assembly (the course taken by the National Front), or do they soften their ideology (the initial intention of the Greens was to stay outside both major parties) and win influence in the National Assembly? Following the result, President Chirac appointed Lionel Jospin, the Socialist leader, as Prime Minister. This meant that the third period of cohabitation under the Fifth Republic would begin; the increasing number of different parties controlling the Presidency and National Assembly was beginning to frustrate Chirac. European elections two years later resulted in a deeply fragmented result. The Socialist Party came first, but with just 22% of the vote, this was hardly a resounding victory. Coming up to this election, a new party called the Rally for France had split out of the Rally for the Republic. This party was led by controversial former minister Charles Pasqua, and ran on a Eurosceptic platform, and won 13%. The original Rally for the Republic won 12.8%, the Greens won 9.7%, the UDF won 9.2%, the Communists won 6.8%, a new centre-right party called Hunting, Fishing, Nature, Tradition won 6.7%. The National Front won just 5.7%; their vote had been split by the new entrants on the centre-right. One year later, a referendum took place on a change in term limits. The frustration at mid-term legislative elections, which were caused by presidential and legislative terms being different. The referendum abolished this by reducing presidential terms to five years. This would mean that legislative elections could follow presidential elections, thus meaning that the results would be less likely to change. The proposal was supported by RPR, UDF and the Socialists. It was opposed by the Communist Party and by some RPR members. On the day 73.2% voters voted Yes, and the proposal passed. However, turnout was pathetically low, at just 30%, thus suggesting that voters were disinterested. Presidential elections were scheduled for 2002, and as the election neared, Socialist candidate Lionel Jospin was in the lead. However, the large number of leftist candidates was to have an unfortunate effect on this lead. The result put Chirac in the lead, but his main opponent Lionel Jospin did not win first place. Instead, Le Pen won second place, thus meaning that the second round would be between Chirac and Le Pen. The issue for Jospin was that leftist voters, feeling certain that Jospin would win second place, voted for minor parties in the first round. Almost all the other candidates endorsed Chirac over Le Pen, and polls showed that Chirac would win a landslide victory over Le Pen. Leftist voters reluctantly supported Chirac, and he won the biggest victory for presidential elections in the Fifth Republic. The result demonstrated a problem with the two-round system; while vote-splitting and the 'spoiler effect' were less of a problem, it could still be an issue. The legislative elections later that year were another win for the forces of the right. Chirac had renamed his party the Union for a Popular Movement, and was successful in taking some support from the UDF. The result was a comfortable majority for the Union for a Popular Movement (UMP), which gave President Chirac complete control over the legislature. Importantly, the election showed that France had progressed towards a two-party system; the UDF and Communists had been marginalised and the National Front was irrelevant in terms of seats. In total, the UMP and Socialists had 86% of the seats. The law for electing the European Parliament was changed in 2003. Previously, a national list system was used, with a 5% threshold. However, the system was changed to create eight national constituencies, with an average magnitude of 9. No threshold applied in these constituencies. The goal of this was to improve relations between members of the European Parliament and their constituents. The result was a comfortable win for the forces of the left, although you could hardly take the results as a prediction of the presidential election. The National Front polled fairly poorly, perhaps due to the presence of the Movement for France, a new Eurosceptic party. President Chirac chose not to run for re-election in 2007, and he was replaced as UMP candidate by Nicolas Sarkozy. Sarkozy was a fairly right-wing candidate within the UMP, and the UDF chose to nominate an alternative candidate, who was Francois Bayrou. The Socialist Party chose Segoilene Royal, a member of the National Assembly and a minister under Mitterand, following a ballot of party members in which she won 60.6%. Jean-Marie Le Pen ran as the National Front candidate, but he lost support to Sarkozy, and was polling in fourth place. Sarkozy was in first, with Royal and Bayrou fighting for second and a place in the runoff. Following this result, the two candidates in the runoff were clamouring for the endorsement of the most prominent candidate in the second round, Bayrou. It was generally expected that he would endorse Sarkozy, as most previous UDF presidential candidates had done. However, he decided not to endorse either candidate, and further announced that he would form a new party. Sarkozy decided to run heavily to the right in the runoff, in the hope of picking up some of Le Pen's votes (Le Pen had called for an abstention). Following this result, opinion polls showed the UMP on course for a landslide win in the legislative elections. While Bayrou's political party (called the Democratic Movement, or MoDem) was fairly strong, its position outside the two major parties put it in a similar position to the National Front. While the party did have fairly strong support, it was rarely enough to make it into the second round in districts, thus meaning that despite their moderate ideology they would not win too many seats. Sarkozy's move to the right had an obvious effect, with the National Front vote tanking, and the party winning no seats. MoDem polled fairly well in the first round, but the low second round vote shows that few candidates ran in the second round, and even fewer were elected (the party won only 3 seats). This result showed that the two-round system did not just disadvantage extreme parties; it disadvantaged all parties outside the two major blocks. Over the next five years, the Global Economic Crisis unfolded, and Sarkozy's popularity took a hit. However, there was an important start to a change in France's constitution. Sarkozy proposed an amendment to the Constitution to introduce a two-term limit for the Presidency, the right for the President to address the National Assembly, and allowed some more parliamentary control over the government. The amendment was passed in a joint sitting of the National Assembly and Senate, with 539 votes out of 538 needed. The crisis meant that Sarkozy was put into a tight race for re-election in 2012. The Socialist Party held an open primary to choose their presidential candidate. Francois Hollande, a former leader of the party, was elected, winning 39.1% in the first round and 56.6% in the second (interestingly, Hollande was up against Segolene Royal, who was not only the Socialist presidential candidate in 2007, but Hollande's former wife. She won 7%, and did not make it to the second round). There was also something of a change in the National Front. For the first time ever, the National Front presidential candidate was not Jean-Marie Le Pen. Instead, his daughter Marine Le Pen was the candidate. Marine was viewed as something of a new image for the party, which she hoped to turn away from the cranky fundamentalism of her father. Following the first round, the candidates who did not make it into the second round made their endorsements. Melenchon, Bayrou, Joly and Poutou all endorsed Hollande, while only Dupont-Aigian endorsed Sarkozy. Le Pen did not endorse. This put Sarkozy in a position of needing to chase after National Front votes. He was fairly successful at this, and the polls tightened up in the runoff race. However, Hollande was able to win, albeit narrower than what was expected in the early days of the election. The legislative elections scheduled for a month later were expected to result in a win for the Socialists. The increase in the National Front obviously would have little affect on the seat distribution, but it would be concerning for the major parties. The Fifth Republic has been fairly stable, as French governments go. Exactly what impact the power of the president has had on this is not clear, but certainly France has had longer-lasting and more stable government. Of course, the change to a presidential system is not the only issue, but it has clearly had some impact. The impact of the two-round system on the party system is fairly clear. Political scientist Maurice Duverger is well known for Duverger's Law, a hypothesis where he claimed that the two-round system would lead to a party system with two large groups comprised of smaller parties. France certainly has this, with a few client parties on the left (Greens, Radicals) and a few on the right (Centrist Alliance, right-wing Radicals). The existence of the National Front, and its strong performance in recent elections, has put pressure on this system. The most recent European election resulted in the National Front being the largest party (albeit with only 24.8% of the vote) and they look likely to make significant gains in recent times. What impact has the two-round system had on the National Front? Its proponents say that it has reduced extremism in French politics, and has kept the National Assembly moderate. However, it could also be claimed that the system has meant that politicians from the major parties are unresponsive to political change, which has led to dissatisfaction with politicians, which has led to the rise of extremism. In terms of presidential power, the powers given to the President are fairly broad compared to the other countries of Europe, which are mostly parliamentary. However, the National Assembly still has control over the instruments of government, as the Prime Minister requires its confidence. The National Assembly also has supreme legislative power, because the President does not have a veto. The shortening of legislative terms has meant that different parties controlling houses is rare, but in the event that it happens, there is a change in the people who hold executive power.